I walked the footpath from home down to the River Darenth – cold, blue sky, low bright sun and frost lifting in the late morning. 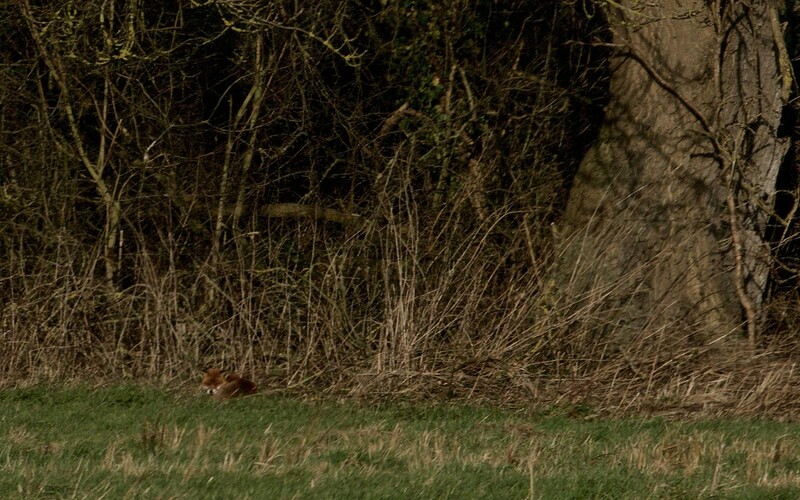 Not much about until a dog fox (I think, since he appeared large) trotted the path in front of me. He worked a wet pasture half-heartedly and only looked up when I closed the stile too sharply, and then disappeared into the woodland by the river. Scolding magpies kept an eye. I carried on, stodged about close to the river and found little but on my return I found him curled in the field edge enjoying the sun. With the river behind he only had to keep watch to the front; he seemed to know he was on safe ground. I will look for him again. Snoozing fox on a warm day. Could picture it in my mind as you followed the dog fox. good descriptive text. Can’t wait for your next blog.